Have you started to lose site of your New Years Resolution to drop the weight? Jump start your metabolism with this short yoga sequence. Begin by sitting in a comfortable crossed legged position on a blanket or two so that your spine is upright. Take a few relaxed breaths. Take an inhale then exhale and draw your abdomen in. Concentrate on taking 20 short, forced exhalations as your abdomen continues to draw in and up. With the last inhale pause at the top and hold for as long is as comfortable without strain. Exhale slowly and take several relaxed breaths. In Kapalabhati, each exhale is aiding in the elimination of the metabolic wastes from the lungs. The heat created from the forced abdominal breaths will begin to stoke the digestive fire, Agni, massaging the internal organs and prompting them for elimination. From your crossed legged position, draw your left foot closer to your groin and cross the right leg over placing the foot on the floor. 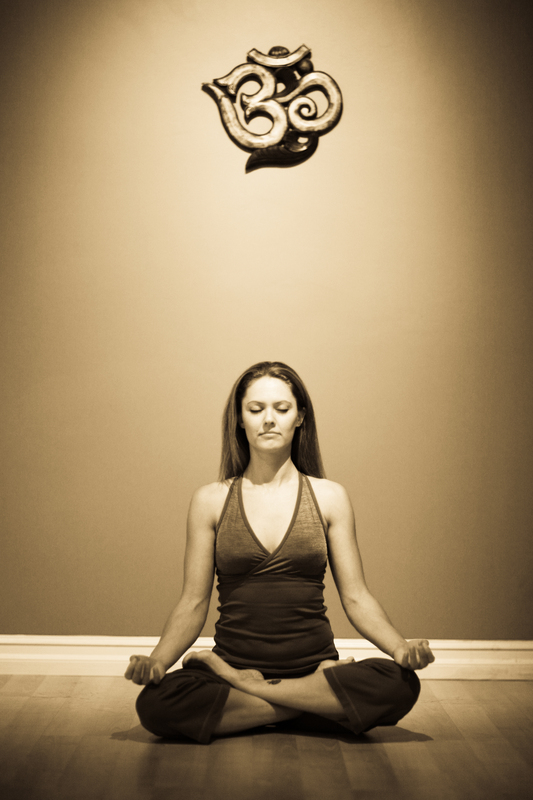 Take an inhale and reach your right arm overhead and place it on the floor behind you. Keeping the spine straight cross your left elbow over the right knee and gently twist to the right on exhale. Inhale, lengthen the spine. Exhale, twist from the belly revolving the torso to the right. Repeat for several breaths. Unwind and repeat on the other side. In twists, always begin with your chest opening to the right and then follow with the left side. This will stimulate the ascending colon then the descending colon, which will move the contents of the intestines in a clockwise fashion to help promote proper elimination. Come to a standing position at the top of your mat with your hands at your heart. Take an inhale and reach your arms overhead as you gaze between the hands. Exhale and hinge from the hips as you forward fold. Inhale and lengthen the spine as you come up half way with your hands on the floor or props. Exhale and step back into plank and slowly lower the body with control to the ground with the elbows drawing into the body and the legs strong. Inhale and open the chest as you straighten the arms and root through your feet for upward facing dog. Exhale as you press your hips up and back for downward facing dog. Take 5 breaths here. Inhale and come high to your toes and exhale step or jump the feet between the hands. Inhale, bring the chest up half way again and exhale forward fold. Inhale with a flat back reach the arms up to the sky and exhale the hands back down to the heart. Repeat for 5 cycles. Sun Salutations help to build the heat in the body and get the cardiovascular system working more efficiently. Coordinating the breath and the movement will further help to eliminate metabolic wastes from the blood and lungs. Lie down on your back with your arms by your sides. Bend your knees and your place your feet hip width apart and parallel. Press down into the mat through your feet, hands and shoulders as you lift your hips off the floor. Interlace your hands and walk each shoulder blade underneath you so that you’re not resting on your cervical spine. Lengthen your tailbone to the back of your knees and spin your inner thighs down. Breathe here for 5 breaths then release the hands and slowly lower down. Bridge pose is a great tool for stimulating the thyroid which is responsible for boosting your metabolism. With the back bends you will also tone the kidneys, aiding in further elimination of wastes from the body. Place 2 blankets with the folded edges on the end of your mat. Fold the end of the blanket on top of the blankets for traction. Lie down with your shoulders on the edge of the blankets and the head on the floor. Hold the edges of the mat with your hands and bend the knees drawing them into your chest rolling your hips off the floor and placing the feet behind you. Place your hands on your lower back and walk the shoulder blades underneath you. Press down firmly into your elbows and lift one leg at a time to the ceiling. Stay here for several breaths then lower your legs to the floor and slowly roll the spine and hips back down. Inch back off the blankets until your shoulders are off and the arms have a little bend in cactus arms. Take a few breaths here and then remove your props and rest in Savasana. Inversions assist in the venous flow from the lower limbs and internal organs to the heart and lungs. Metabolic wastes are removed from the blood via the lymph nodes and the exhalation of the lungs. Shoulderstand in particular also will continue to stimulate the thyroid for increased metabolism, just as in bridge pose.